Alex Tagliani is going to be a busy man this weekend in Trois-Rivières where he is ready to defend his NASCAR Pinty's race champion title. Busy, because besides his on-track duties, the Canadian Motorsports Hall of Fame inductee will also entertain race fans at the RONA booth located inside the Grand Prix paddock to talk about the new RONA Contactors Division sponsorship which will grace his Chevrolet Silverado at the upcoming August 25-26 NASCAR Truck Series race at Canadian Tire Motorsport Park (CTMP). Tagliani has been quite impressive in his last three Trois-Rivières Grand Prix. He climbed the podium on each occasion and took top honours last year, winning in his EpiPen/RONA/St Hubert Chevrolet. In eight NASCAR starts on the urban track, Tagliani qualified in the top-three seven times, four times on the front row and twice on the pole. "My first goal this weekend is to defend and win the Grand Prix de Trois-Rivières. Team 22 Racing is ready for this roaring challenge," said Alex Tagliani. "We have an excellent road racing car in which we finished second last month in Toronto. The competition will be fierce as everyone wants to win this race, especially me." Alex invites all race fans attending the Grand Prix this weekend to stop by the RONA booth to meet him and chat about Sunday's NASCAR Pinty's race and his chances for a repeat win. He will also entertain fans and share his thoughts on his next project - driving his RONA Contractors sponsored Chevrolet Silverado in the NASCAR Camping World Truck Series race scheduled to run on August 26. 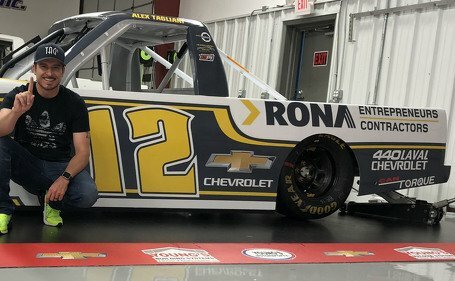 "It is also exciting to represent RONA, this time through their Contractors Division, in this very important NASCAR truck race coming up in two weeks," continued Tagliani. "I will be heading to the Canadian Tire Motorsport Park road course to win in both the NASCAR Pinty's and the NASCAR Camping World Truck Series races. Because we made an early deal with team Young's Motorsports, we will be more than ready this time around. All that matters is that I win for RONA and all my other sponsors. "This weekend in Trois-Rivières, RONA has set up a booth in the Grand Prix paddock where fans are invited to register in the MEGA Tiny Rally Contest and have a chance of winning the Grand Prize: a VIP Race Weekend at a 2019 NASCAR USA race of their choice. A grand prize estimated at $15,000 offered by RONA and CRAFTSMAN." The MEGA Tiny Rally Contest also offers fans the opportunity to compete in the RONA radio remote-controlled racetrack where numerous prizes are offered. Beside the NASCAR VIP Weekend Grand Prize, other prizes are also at stake such as sets of FAST Wheels alloy rims and Continental tires. The Grand Prix of Trois-Rivières, a 50-lap race (123 kilometres) around the 11-turn, 2.46-kilometre urban track will be run on Saturday, August 12 at 2:15 p.m. English viewers who can tune into the French network RDS, can watch the race live. Drivers will first be on track on Saturday for their practice session at 12:30 p.m., followed by qualifying at 5:15 p.m. In the driver's championship race, Tagliani is tied in fourth place with D.J. Kennington with 270 points, 16 points behind championship leader L.P. Dumoulin. In 65 NASCAR Pinty's Series starts, Tagliani has six wins, nine poles, 26 top-fives and 43 top-ten finishes. For more information on Alex Tagliani, please visit www.tagliani.com, follow him on Twitter at @tagliani, @tagliani18 on Instagram and like him on Facebook atwww.facebook.com/Tagliani.